Each Thursday throughout the regular season, The Pick List will feature a few of the best match-ups across the state, and make our predictions on a handful of other games. *** On Friday, Kpreps will feature a pair of Class 3A games between unbeaten teams including No. 4 Conway Springs at No. 5 Garden Plain and Sabetha at No. 1 Nemaha Central. As a result, we’ll only preview five games on this week’s edition of The Pick List. There is a lot on the line in this week’s showdown of ranked teams in the Wichita City League. Bishop Carroll travels to Wichita Heights in a game that will have implications regarding the league title in addition to bracket seeding on the western half of Class 5A. Bishop Carroll remains unbeaten in league play at 4-0; one game ahead of Wichita Heights and Wichita Northwest. Carroll scored in the final 15 seconds to top Northwest 40-35 back in the season-opener, while a short-handed Heights team fell to Northwest 37-20 in Week 2. Wichita Heights played the first two weeks without its starting backfield including standout quarterback K’Vontae Baker and three others players. The Falcons dropped both games – a 39-25 decision at Olathe North and the loss to Northwest. Baker returned in Week 3 and put on a show in a 65-0 blowout of Dodge City. The junior rushed for 454 yards and eight touchdowns in the win on only 13 carries. Baker and the Falcons have been on a roll ever since. Last week, Heights trailed Kapaun Mount Carmel 24-20 in the fourth quarter before getting an interception and a blocked punt to spur 14 points and a 34-24 win. Baker scored four of the Falcon’s touchdowns. Carroll opened the season with four straight wins before falling 54-45 to Derby in a shootout. The Golden Eagles trailed that game by 16 points on multiple occasions before rallying to within 47-45 with five minutes left in the fourth quarter. Carroll actually forced a Derby punt to get the ball back, but lost a fumble shortly after which led to a Panther touchdown. Senior quarterback Braden Howell has played well for the Eagles. Howell passed for 472 yards and four touchdowns in the Derby game, but Carroll managed only 51 yards on 32 rush attempts. Last week, Carroll bounced back from the Derby loss with a 42-6 win over Wichita South. The Eagles currently sit as the No. 2 seed on the west side of 5A at 5-1 along with Maize and Valley Center. Four teams, including Wichita Heights, are one game back at 4-2. Last season, Howell tossed a 6-yard touchdown pass to Clay Cundiff with less than a minute to go to lead Carroll to a 42-41 win over Heights. The Falcons, ranked No. 1 in Class 5A at the time, led 41-28 with five minutes left before Carroll scored two touchdowns to pull off the victory. Kapaun Mount Carmel will travel to suburban Kansas City to take on St. James Academy in a game pitting two teams looking to rebound from close losses. The Kapaun Crusaders have dropped two straight games after a 4-0 start to the season. Kapaun was shut out in the second half by Wichita Northwest as the Grizzlies rallied for 13 points and a 26-14 win. Last week, the Crusaders led Wichita Heights 24-20 in the fourth quarter before an interception and a blocked punt set up two Falcon touchdowns. Heights went on to win 34-24. Now Kapaun will take on a St. James team ranked fifth in Class 5A – their third consecutive game against a ranked opponent. Both Kapaun and St. James are led by senior running backs having great seasons. The Crusaders are led by senior running back Nick Channel (6-1, 205) who has rushed for 789 yards. Meanwhile, senior Jack Petz has been the workhorse for St. James Academy. Petz has rushed for 734 yards and 11 touchdowns to lead the Thunder. St. James began the season with five consecutive victories before falling to No. 2 St. Thomas Aquinas, 34-14, last week. The Thunder managed just 160 yards of total offense against the Saints; 102 coming from Petz. For St. James to have success, they’ll need to keep defenses off balance with a passing attack that utilizes senior Luke Heller and sophomore Jack Moellers. Heller has thrown for 579 yards and five scores, while Moellers has 217 passing yards and three touchdowns. St. James won this match-up last season 28-17 at Wichita State’s Cessna Stadium. This year’s game will be played at Mill Valley High School since St. James does not have a home field. This has been a fun home-and-“home” series and one that is planned to continue for the next cycle. One of Kansas’ premier rivalries kicks off Class 4A, Division I, District 7 play. Andale finished 8-2 last fall under coach Gary O’Hair before he retired and moved to New Mexico. The Indians have continued success with former assistant Dylan Schmidt. The Indians have opened 6-0 with a total margin of 238-48 against the No. 18 SOS in the classification. Buhler has a total score of 186-81 with the No. 8 SOS. The Crusaders have rolled after a season-opening loss to McPherson (33-21) with multiple quality wins. Buhler defeated Wichita Collegiate, 47-21, in Week 3 and then Maize South, 17-14, in Week 4 to move back into the top-5. Last week, Buhler had a quality road win at Augusta, 24-6, and the Orioles’ strong defense. Andale defeated Collegiate, 35-7, on the road last week. The Indians also delivered a great performance, especially in forcing turnovers and pass defense, against Mulvane in Week 3. Andale won 48-20 and limited Mulvane standout quarterback Jayden Price, a North Dakota State commit, to 7 of 17 passing for 116 yards with one score and three interceptions. The year prior, Price had a huge performance in a 61-52 Andale win. Ethan Baalman has mainly played quarterback, including 172 passing yards versus Mulvane. Jeremy Jansen had 92 rushing yards versus Mulvane. For Buhler, the Crusader running game has returned. Dalton Brown had more than 300 rushing yards in the Collegiate victory. Against Maize South, Buhler built a 17-0 lead midway through the second quarter, and Brown had 158 rushing yards. Andale held the edge in this rivalry for decades, but Buhler has won the last two meetings, 16-0 and 28-21. Since ’09, the margins have been 13, three, seven, 21, 16 and seven points. Expect another close one, but Buhler’s line with Brendan Webb and Braden Rose controls the game. A highly anticipated matchup that will likely decide Eight-Man, Division I, District 4. A possible five-team district race has quickly winnowed to two. Victoria and Osborne both have defeated Logan-Palco. Osborne owns a win against Solomon, and Victoria has defeated Bennington. The teams and coaches have multiple similarities. Both Victoria’s Doug Oberle and Osborne’s Cullen Riner have won at least one state title as both an assistant and head coach at their respective school. Osborne is the defending Eight-Man, Division I state champion. Each has veterans, especially at running back with Bulldog sophomore Darrien Holloway and senior Denton Schurr and Victoria seniors Collin Kisner and Cooper Pfanenstiel. 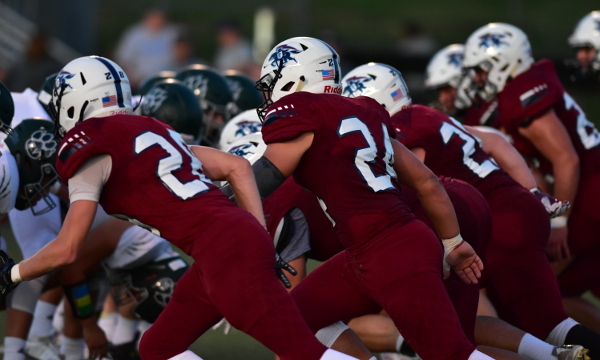 Each has taken a two-point loss to a top-five Division II team on the road in Week 4. Osborne fell to Pike Valley (30-28) and Victoria lost to Otis-Bison (22-20). Osborne junior Darnell Holloway has played well in his first fall as a starter. He has completed 18 of 30 passes for 328 yards with a 4/3 TD/INT ratio. He has rushed 56 times for 555 yards and 11 TDs. Darrien has delivered 56 carries for 462 yards and eight scores. Senior Denton Schurr has 99 carries for 872 yards and 15 TDs. Senior Roxton Brown has enjoyed a great season with 60 tackles, six for loss. Victoria, 5-4 last season, has matched its win total behind a much-improved defense. Osborne has an average margin of 48-20. Victoria, against a much tougher slate, is at 44-14. Last year, the Knights permitted 31.6 points a contest. Kisner leads the offense with 76 carries for 730 yards and 14 rushing scores. Pfanenstiel has 379 yards. Victoria’s run defense has held Logan-Palco standout running back David Thompson and Bennington speedster J.J. Allen each under 100 yards the last two weeks. Thompson had 126 against Osborne. However, the Knights are banged up on the line, especially with senior Wyatt Engel, who missed the Bennington contest. Senior end Lucas Taylor stepped up with four sacks and helped force a safety. Despite the success, these two squads have rarely matched up with a 54-8 Osborne win last fall the only meeting in the last 12 years. Osborne has won nine straight home games. Victoria keeps the score close, but its thin line – especially if Engel, a two-way starter, doesn’t play – and Osborne’s overall speed is enough for a Bulldog win. Two of the state’s smallest rosters match up in a huge Eight-Man, Division II, District 6 contest. Dighton has just 10 players, while Otis-Bison’s roster lists 15. Last year, Dighton won a 36-30 home contest that came down to the final seconds and featured a wild ending in one of the toughest losses in Otis-Bison coach Travis Starr’s 13 years with the Cougars. With the score tied at 30, Otis-Bison had the ball at the 8-yard line. At that point, the Cougars had 12 straight running plays on the drive. Otis-Bison called a pass, and Dighton picked it off with 2 minutes, 30 seconds left. Then, Dighton drove 65 yards and scored the game-winning touchdown with 1:11 left. The game effectively eliminated the Cougars from the postseason. Dighton, with just 14 players, enjoyed the best year in school history with a state runner-up appearance to Hanover. This fall, Otis-Bison, Dighton and Hodgeman County have emerged as the three top District 6 squads. While Otis-Bison entered the ’16 Dighton contest already with a district loss to Wallace County, both teams are unbeaten in district play this fall. Otis-Bison opened with two shutouts then lost at Central Plains, 36-12, in a game that stayed close for the most of the second half. The Cougars had a marquee victory, 22-20, versus rival Victoria for the Knights’ lone loss. Then, Otis-Bison rolled over Wallace County, 70-24. The Cougars defeated Greeley County, 50-0, last week. Otis-Bison has a total margin of 268-80 against the No. 12 strength of schedule in the 48-team classification. Dighton is at 256-42 with the No. 43 SOS. The Hornets stand second to Hanover in classification scoring defense. Otis-Bison is seventh in defense. Like last year, Dighton has built an undefeated record while being ranked outside of the top-5. The Hornets own solid wins versus Northern Valley (36-20) and Wallace County, 20-8, last week. Dighton graduated multiple standouts, namely quarterback Tyler Lingg and wide out Dylan Foos. All-state lineman Logan Lingg returned. Dighton has rushed for 203 yards and passed for 85 a contest. Last year, the Hornets passed for 180 and rushed for 153 a game. Junior Blair Hoffman has completed 34 of 52 passes for 512 yards with a 9/3 TD/INT ratio. He leads the team with 92 carries for 616 yards and 14 scores. Junior Dalton Hoffman has 70 carries for 498 yards and seven rushing TDs. Dighton is plus-four in turnover margin. Senior Isaac Torson and Dalton Hoffman lead with 11 TFLs. For the Cougars, junior Anton Foust has played very well in his first season at quarterback. He has completed 23 of 38 passes for 442 yards with an 8/1 TD/INT ratio. He has rushed 58 times for 435 yards and seven TDs. Senior Blake Bahr has 44 carries for 511 yards and 12 touchdowns. Bahr and junior Maitland Wiltse have combined for 19 catches, nine for scores. Otis-Bison holds big advantages over Dighton in yards per pass attempt (12.6 to 9.8) and yards per carry (8.6 to 6.3). This is the fourth matchup between the two teams since ’04. Otis-Bison won 50-34 in ’12, while Dighton earned a 58-12 victory in ’13 before the win last season. Otis-Bison, which gets Wallace County, Dighton and Hodgeman County all at home, is 9-2 in its last 11 home games. Great credit to Dighton for pulling off another unexpected season, but Otis-Bison is battle-tested, more explosive and playing at home.